After volunteering all Saturday under the hot sun for Keep Atlanta Beautiful, I was looking forward splashing around in some chilly river water. I was expecting to go right after my stunt with KAB, but with the day getting late, we decided to wait until Sunday. That night I pack up Zero Waste snacks; tortilla chips, hummus, grapes, a veggie sandwich and a mason jar full of water and dreamed of wading in the water the very next day. The weather forecast expected possible rain, but either way I would be backstroking in the Hooch, so I wasn't too bothered. I left the house around 11am to meet my friends at the North Springs Marta Station. They scooped me up and we rode to the Chattahoochee National Park in John's Creek. Before getting out the car, I had shed my outer clothes and re-checked my book bag for everything I needed. 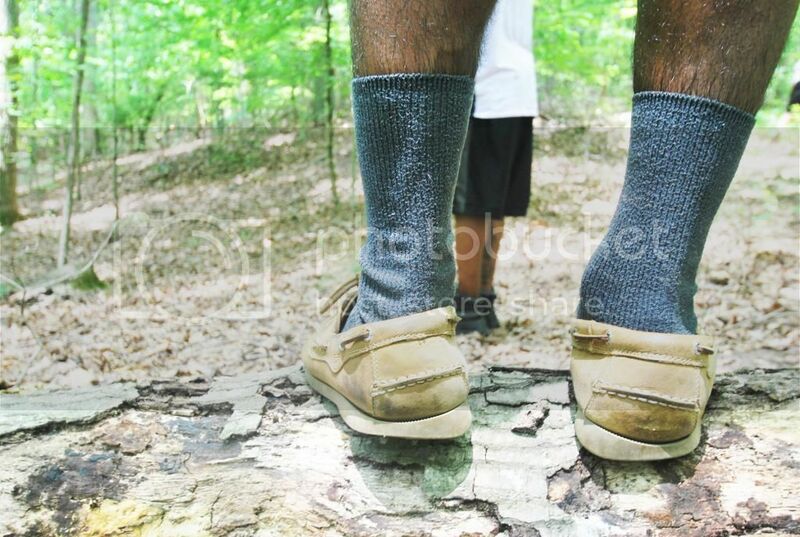 We walked through the trails a bit, climbing large rocks and stepping over rotted tree bark. While walking, we sung some 90s R&B favorites and picked at moss growing from the trees. At one point we sat down and listened as my friend Wesley read an excerpt from Thoreau. Something along the lines of wasting time being busy and buying things and settings goals; when we are all doomed to die anyway. Crazy truth!! I munched on some grapes and gave a "here, here!" to toast the wise words. We left the trails for the river and I started to get goosebumps as I stepped down the wood-framed dock that met the river. It was lush at first sight. Families were scattered at different planks in the river splashing about, sitting in lawn chairs and chatting. I stepped into the water and it was certainly cold! I started to jump back out but kind of stood there getting my body adjusted. The water came to my calves at that point so I stepped once more and sunk into the water. Now the water was thigh high and walking through, being careful not to trip over any rocks and trusting my 6th sense like a boss! Afraid that my camera would get wet, I would watch the guys waddle through the water first to be sure I wouldn't get my backpack wet. We made it pass the island and onto the 'adult swim' side of shore. 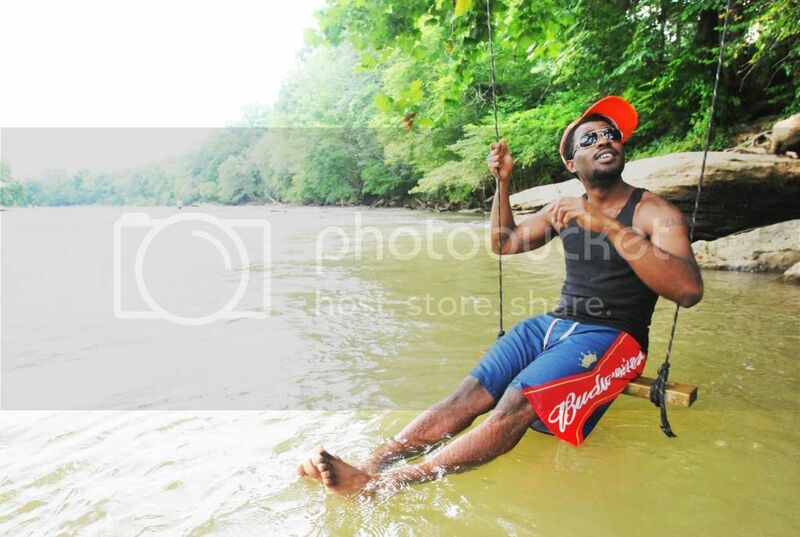 People were relaxing and drinking beers, when I spotted a swing across the river. I was hesitant to go at first, because my friend Mike had just told us to watch out for snakes, and since no one else was around I figure it maybe their 'side' of the water so I waited with caution. Aha! I make it without troubles. I climb up and swing back and forth. Slowing down from time to time, I feel the current push against my legs shifting the swing South. I decide I want to take pictures by the swing so I walk back to the shore and grab my D60, and this is when everybody looks at me like I'm silly for sacrificing my camera to the holy Hoochee waters. Usually, I'm not the die-hard photography, but that day I really wanted to get the close up by the swing. 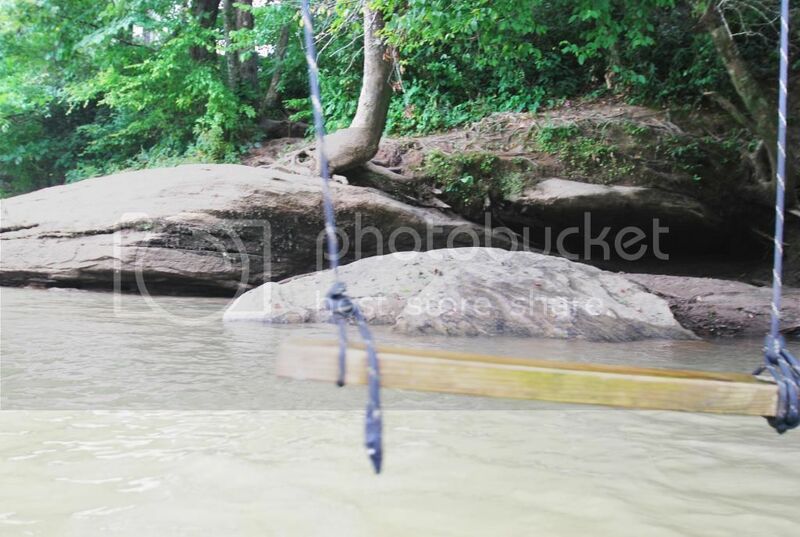 Bracing for the unknown abyss in the water and the balance-breaking currents, I tread for the swing. I get to a rock with strong stream and worry that I may not make it without slipping. I get flustered and started to turn back, but the guys wouldn't let me. "Take your time," "Baby steps Ree, baby Steps," they said. It was pretty encouraging to hear them say that, and the thought that they didn't want me to give up meant a lot. I take baby steps the rest of the way always leading with the right and following up on the left. At one pointI turn back to the shore and realize EVERYBODY is watching. I think they were cheering me on too!